Today was a beautiful day. Lots of sunshine with a little bit of haze on the water. The temperature was in the low seventies and it cooled down into the mid sixties by early afternoon. In contrast to our weather, we learned from friends travelling in Alaska that the temperature in Fairbanks and Denali National Park was in the eightees. Go figure! We opted to skip the town of Bar Harbor because the Fourth of July festivities had filled an already fairly crowded town. 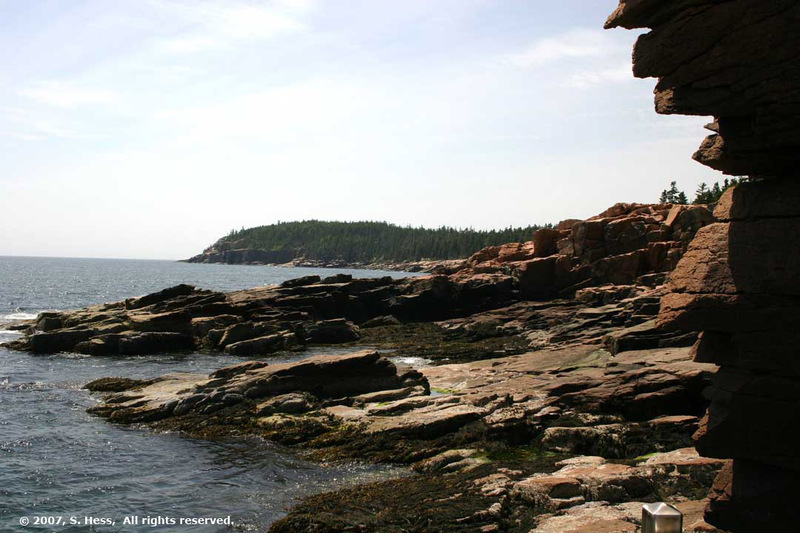 Instead we went into Acadia National Park, which occupies the bulk of Mount Desert Island. Most of the park roads are carriage roads (built by John D. Rockefeller) which are limited to non-motorized vehicles (i.e. bicycles) and pedestrians. 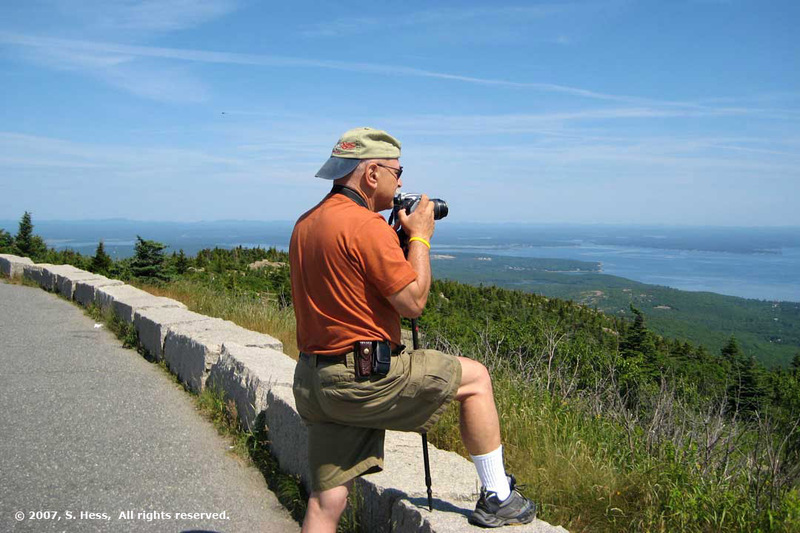 We drove on the 20 mile long Loop Road, which circles Cadillac Mountain and offers views of the different facets of the park. 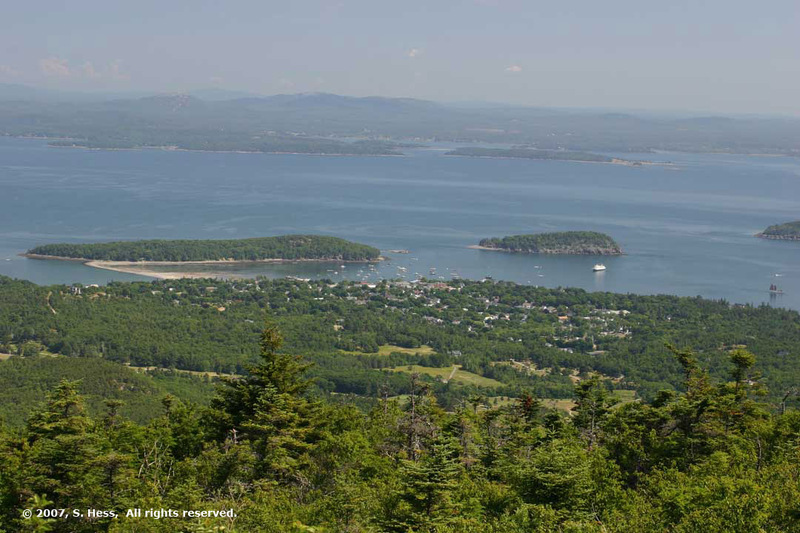 Cadillac Mountain, at 1,530 feet, is the tallest mountain on the east coast and its summit is accessible by a spur off the loop road. 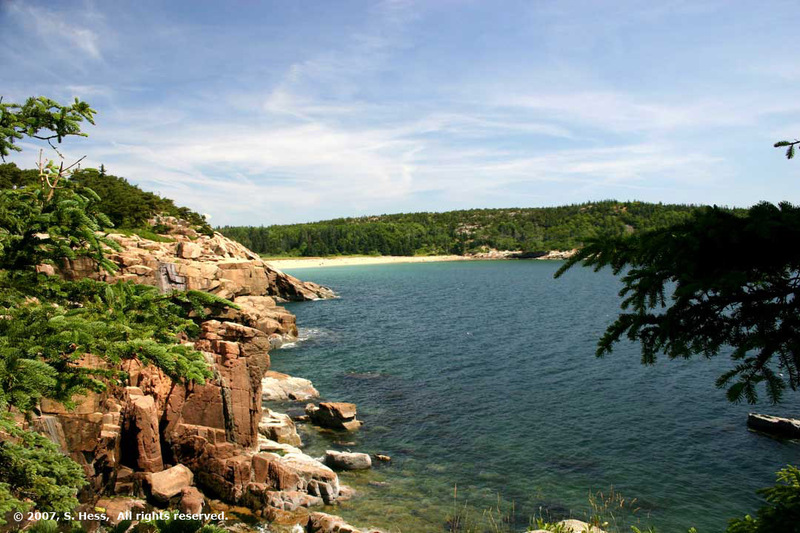 The summit offers a 360 degree view of Acadia National Park and the surrounding water. The National Park Service literature indicates that the Loop Road can be completed in an hour but recommends at least three. Even at three hours, we were not able to really sample all that the park has to offer. 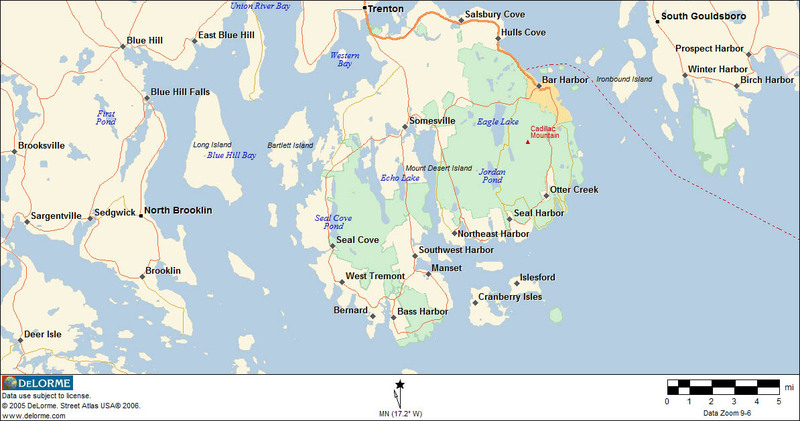 Originally,, we had planned to be in Bar Harbor for three full days. We thought we would do some kayaking on some of the coastal waters or inland ponds. We also thought about taking one of the tour boat operating out of Bar Harbor. Because of our earlier problems we could not spend the time we had wanted and we are determined to come back for another try at this area. 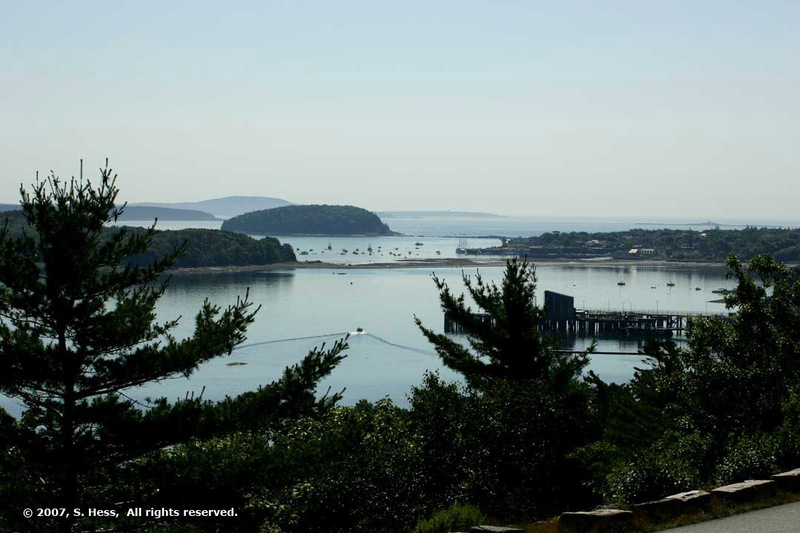 Two views of Bar Harbor. The picture on the left was taken from the lower end of the Loop Road. The structure on the right hand side of the picture is the dock for the Ferry to Yarmouth, Nova Scotia. The picture on the right was taken from the summit of Cadillac Mountain. 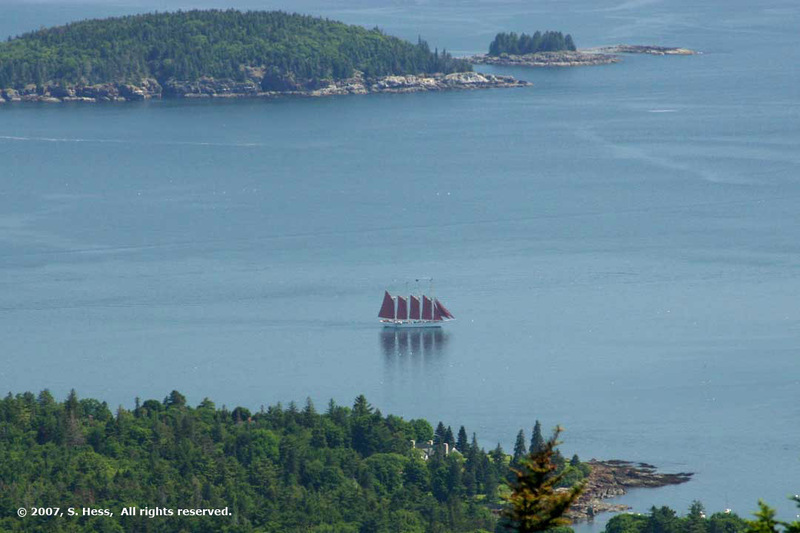 The Windjammer Margaret Todd under sail, viewed from Cadillac Mountain. She is used for short excursions out of Bar Harbor. We thought she might be an old vessel but it turns out that she is less tha ten years old. For more information, click here. 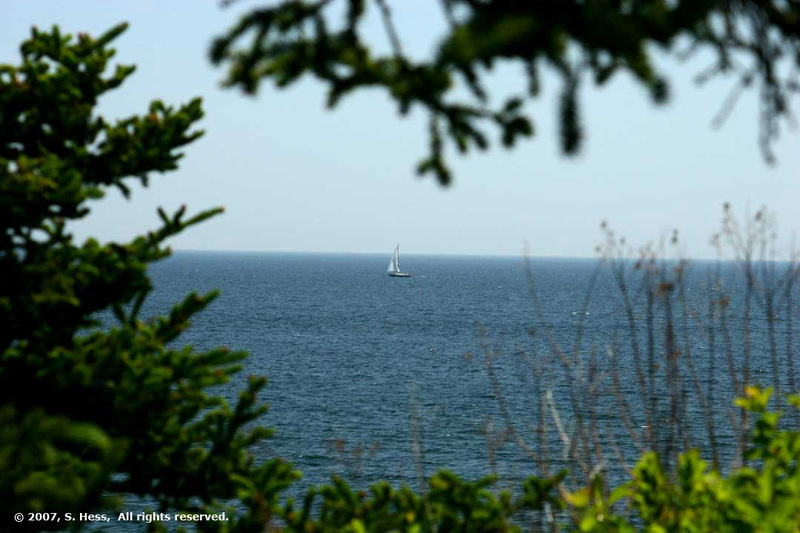 Sailing of the coast of Acadia National Park.